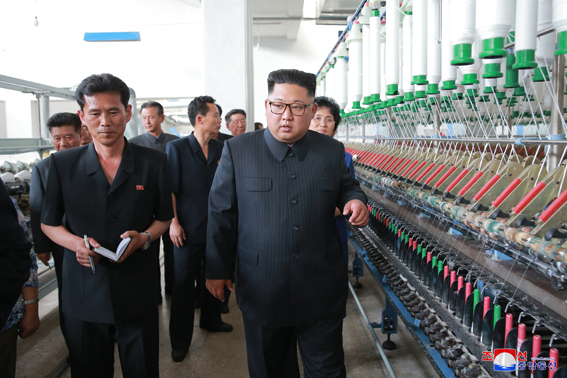 Kim Jong Un, Chairman of the Workers’ Party of Korea, Chairman of the State Affairs Commission of the DPRK and Supreme Commander of the Korean People’s Army, visited the Sinuiju Textile Mill. He was accompanied by An Jong Su, Hwang Pyong So and other senior officials of the WPK Central Committee. He looked round the rooms dedicated to education with revolutionary relics and the mill’s history. The mill inaugurated in September 1959 is deeply associated with the undying leadership exploits of President Kim Il Sung and Chairman Kim Jong Il, who designated the site of the mill in the hard post-war times in order to address the clothing problem of the people in the western part of the country and visited the mill several times to turn it into a comprehensive textile mill that can play its part in the development of the local light industry. Supreme Leader Kim Jong Un made the rounds of the mill to acquaint himself with its production and management. He criticized the mill for failing to fulfil its annual production plan over the years, to operate the facilities and equipment at full capacity with less attention paid to science and technology, and to modernize itself at a high level. He specified tasks and ways to refurbish the mill in line with the requirements of the current times. The mill’s Party committee should conduct ideological education among the workers and technicians in a dynamic manner so that they could devote themselves patriotically with a sense of responsibility for being in direct charge of the modernization project, he said. It is needed, he added, to transform the mill’s production processes into labour-saving and technology-intensive ones and apply cutting-edge technologies to do production control and business activities in a scientific, rational way. He called on the mill’s officials and employees to turn out in the effort to build up the material, technical foundations of the mill and spruce it up in pursuit of a long-term plan for steadily boosting the production capacity during the five-year strategy for national economic development. They should put the production processes on a scientific and modern basis and shake up the production buildings and the compound and vicinity by next year that marks the 60th anniversary of the mill, he stated. He promised that the Party would ensure a hostel as good as those at the Pyongyang Kim Jong Suk Textile Mill and the Pyongyang Kim Jong Suk Silk Mill is built for the employees of the mill. And he designated the site of the hostel and took a measure for mobilizing a strong construction force.